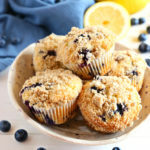 These Best Ever Blueberry Streusel Muffins are the perfect sweet snack! This is such an easy recipe that's packed with fresh blueberries and a sweet, crunchy streusel topping! Add the flour, baking powder, salt, sugar and lemon zest to a large bowl and whisk together to combine. Add the blueberries and toss well to coat. These muffins will keep in an airtight container for several days at room temperature.